The gross domestic product (GDP) has just turned eighty. It was indeed in 1934 that a young economist by the name of Simon Kuznets (who would later on receive a Nobel Prize for this) presented his first report on the design of national income accounts to the US congress. Those were the hard times of the Great Depression and governments were desperately seeking some type of indicator to gauge if and how the economy was recovering. GDP did exactly that: it conflated the amount of spending in goods and services into one single number, which would go up in good times and down in bad times. A few years later, the Second World War gave GDP unparalleled prominence in politics, as the availability of regular statistics about industrial output helped the American government outpace its enemies in terms of munitions’ production. More importantly, it allowed for the conversion of the civilian economy into a war machine without hampering internal consumption, a major advantage in generating revenues for the war (thus avoiding bottlenecks such as those experienced by Hitler’s Germany) and propelling large-scale consumption in the post-war period. After that, the UN, the World Bank and the IMF began to export the GDP accounts to the rest of the world, turning this number into the gold standard of economic success. Much more than a number, GDP has since come to represent a model of society, thereby influencing not only economic, but also political and cultural processes. Our geography, our cities, our lifestyles are defined by the GDP circle of production and consumption. GDP has also colonized the lexicon of governance and the distribution of power at the global level. International clubs such as the G8, or the G20 have been defined according to their members’ contribution to the world’s gross output. The concepts of ‘emerging markets’ and ‘emerging powers’ refer to a nation’s current and projected GDP growth, as well as the ‘ambivalent’ distinction between the developed and the under-developed (or developing) world. With the convergence of economic, social and environmental crises, there is now growing concern among progressive economists, politicians and scholars about the flaws of this number. Recently, the magazine Nature published a global appeal to “leave GDP behind”. 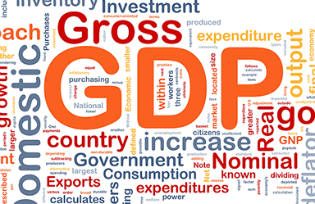 GDP is ‘gross’ in so far as it does not include the depreciation of assets utilized in the production process (such as machineries, tools, vehicles, etc.). Whatever is exchanged outside the market (e.g. within households, in the informal economies, through barter, etc.) does not count. In addition, GDP disregards the value of the natural resources consumed in the process of economic growth, as these are obtained free of charge from nature. Moreover, it does not even consider the economic costs of pollution and environmental degradation, which are obvious consequences of industrial development. All these important omissions make GDP a very selective (some may rightly say myopic) measure of economic performance, let alone social welfare. Household services, for instance, have a fundamental economic impact even though they are not formally priced. If governments had to pay for the innumerable services rendered at the household level (from child and frail care to education), our economies would arguably grind to halt. A study by the Bureau of Economic Analysis estimates that the value of household production in the US accounted for over 30% of economic output every year from 1965 to 2010 with a peak of 39% in 1965, declining to 25.7% in 2010. In many countries, the ‘odd jobs’ and the goods and services exchanged informally provide the necessary subsistence to millions of people and often constitute the backbone of the real economy, albeit they do not feature in GDP. Similarly, disregarding the input of natural resources just because they are not priced by nature makes us forget that economic growth is only possible because of a continuous provision of ‘capital’ from our ecosystems. Agricultural production would not be attainable without clean soil, water, air and other essential ecosystem services. Industrialization would have not been achieved without the fossil fuels, hydrocarbons and energy sources made available by the planet. When these resources are depleted, however, we risk endangering not only economic progress, but also the very natural equilibrium that makes life possible. Is this the type of development model we aspire to achieve in the 21st century? Accounting 101 tells us that profit equals income minus ‘all’ costs. As GDP systematically disregards key sectors in the economy and neglects critical costs, no reasonable businessman would use it to run a company. Yet, it has become the key parameter to run entire societies. The prestigious commission set up by Joseph Stiglitz and Amartya Sen also highlighted the profound inadequacy of GDP as a measure of economic welfare. Time has come for us to listen to Kuznets and retire GDP.